I know, I know. 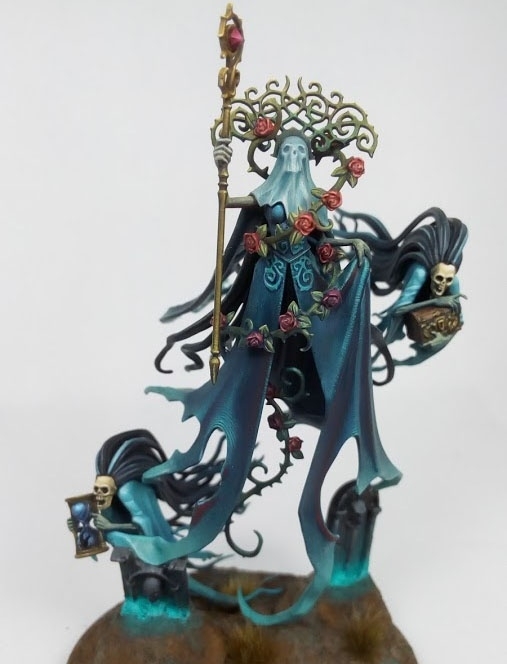 I just did a Lady Olynder model the other week for Mini of the Week, but it's just such a nice mini, and here we get a more traditional take on her color scheme. While Games Workshop opted to paint her all in white, this hobbyist went for a slightly darker scheme. I really like the use of the various shades of blue. Even the veil is just a really light blue. It helps ties it all together and keep it fairly monochromatic while still having a good amount of variance throughout the model. Besides the occasional other color, such as the skulls and flowers, the only other major color is green. Even the gold is a slightly greenish gold. Everything is smooth and crisp, with some fun textures painted onto the dress, especially down near the bottom where it starts to have a glow effect. It looks like they used red to shade the blue in some places as well, which gives it a really cool look. 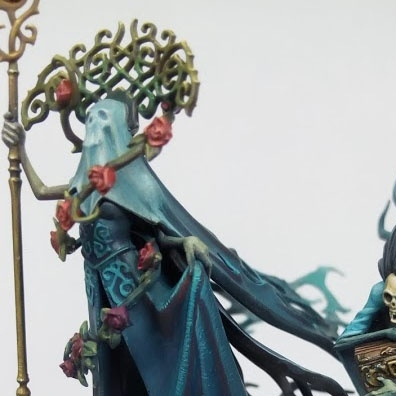 The base on her is fairly simple, but the super bright glow effect around the tomb stones and skulls really pops, and helps tie it into the glowing effect on Olynder herself. Overall I really like it.